Motorola has revamped its Moto Q for AT&T subscribers. While Motorola has released the Moto Q Music for Verizon subscribers, the AT&T version of the Moto Q is more feature packed. The Motorola Q 9h global doesn't have the word "global" appended to its name just for the kick of it, the Motorola Q 9h is a quad band world phone compatible with 850, 900, 1800, and 1900 MHz network bands. 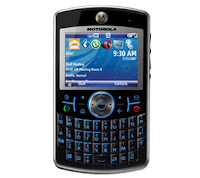 The Motorola Q 9h also has HSDPA capabilities, 2.4 inch display, integrated Bluetooth with A2DP profile, integrated 2.0 mega pixel camera with digital zoom and LED photo light indicator, microSD expansion slot, 64MB built-in memory, 325 MHz processor, micro USB 2.0 connectivity, Windows Mobile 6 OS, and a built-in GPS. The Motorola Q 9h is really for the power user. It can edit your documents using Documents To Go. Though the mobile office is still included in the Motorola Q 9h, after all it is a windows mobile device, Documents To Go still offers better editing features as it keeps the original formatting of your documents. Another value added feature that is packed unto the Motorola Q 9h is the Opera Browser. Windows Mobile Device usually uses pocket internet explorer when you have to surf websites which, like the desktop internet explorer, is very slow and you don't exactly get the whole web 2.0 experience. The Opera Browser on the other hand has tabbed browsing and you can select an option wherein the browser would be detected as a desktop browser rather than a mobile phone browser so you can see the web page as is on your Motorola Q 9h, just like on your desktop PC. The added GPS on the Motorola Q 9h is a welcome factor however, you need to subscribe to TeleNav GPS navigator for $9.99 a month.